If you are a Zipcar member and want a quick way to set up reservation, take a look at this iGoogle gadget that allows you to create a reservation right from your iGoogle page. 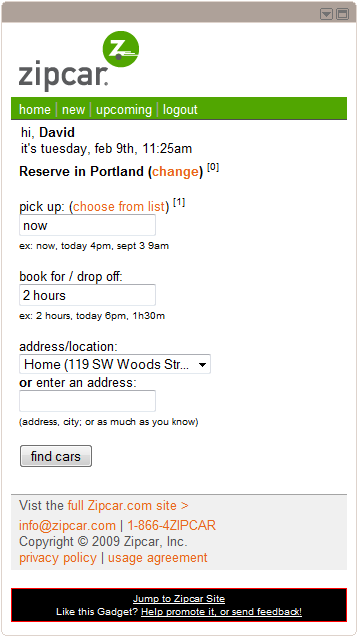 Once you sign in to the system you should be able to quickly set up a reservation using the Zipcar mobile interface. None of your information is kept in the gadget: it all goes through Zipcar just like a standard web page. If you don’t already have a iGoogle page, it’s easy to set one up. Just go to iGoogle and sign in using your Google account (or create a Google/Gmail account if you don’t already have one). Then you can add this (and many other) gadgets to your home page. If you like the gadget you can use the link at the bottom of the gadget to give feedback or promote it (on Twitter, Facebook, your blog, etc…).